Motorists across the country agree: Distracted driving is dangerous driving. In fact, according to the AAA Foundation for Traffic Safety’s 2016 Traffic Safety Culture Index, more than 80 percent of drivers say that texting or e-mailing while driving is a serious threat to safety. 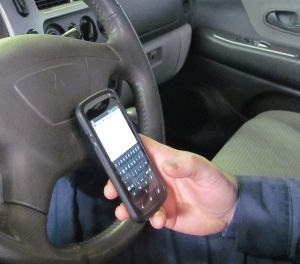 Still, more than 40 percent report having read a text or e-mail while driving in the past 30 days. The reason for this “do as I say, not as I do” attitude may be rooted in human biology. A 2014 study from the University of Connecticut’s Center for Internet and Technology Addiction found that the brain releases dopamine, a neurochemical associated with pleasure, at the sound of an incoming text, e-mail, or social media notification. Simply put: It’s difficult to avoid glancing at your phone while driving, in part, because your brain is chemically conditioned to do just that – no matter the risks. And the risks are significant. A recent National Highway Traffic Safety Administration report estimates that distraction contributes to 16 percent of all fatal crashes – around 5,000 deaths every year. With that terrible toll in mind, tech companies are making it more difficult to use their products while behind the wheel. Take Apple’s iPhone, for example. In the device’s latest operating system update, iOS 11, Apple included a Do Not Disturb While Driving mode. With this feature enabled, iPhones detect when your car is in motion. The app mutes incoming phone calls, notifications, and text messages; and users can configure their device to respond to text messages with a preset, polite response letting friends and family know that they’re driving. For both iPhone and Android users, the DriveSafe Mode app, available in both Google Play Store and the iPhone App Store, allows parents to create an account to notify them when a teen driver is not using DriveSafe Mode. The app automatically silences your phone, and prevents use of the keyboard, while driving.